The Asian Market Success project, supported by the State Government’s Royalties for Regions program, provides WA agrifood businesses with the confidence to invest in accessing and developing high value, premium export markets in Asia. To date, the project has enabled some 50 WA agribusinesses to access a range of export development grants, capacity building programs, and in-market business development resources. The WA Government’s Department of Primary Industries and Regional Development (DPIRD) is pleased to host an ASEAN Market Inbound Buyers (AMIB) Roadshow on 31 March to 7 April 2019. This roadshow provides a great opportunity for WA agribusinesses exporting premium products, meat, seafood and horticulture (fruit and vegetables) sectors to showcase their produce and establish or expand business relationships with importers, hospitality and food service buyers from Singapore, Thailand, Malaysia and Vietnam. The primary objective of the roadshow is to educate, excite and motivate purchases with our Asian trading partners by providing them with firsthand experience of WA agrifood produce, and to expand WA’s presence in ASEAN markets. Dairy Farm Group – Cold Storage (Singapore), JWM Asia (Singapore), Gourmet Partner (Malaysia), Chop Tong Guan (Malaysia), MM Mega Market (Vietnam), San Ha Company (Vietnam), Food Gallery (Thailand), and Central Food Retail, ie TOPS Supermarket (Thailand). – Interest in a range of formats for meats, i.e. retail pack, and primal cuts and whole carcass for their own butchering in Importers facilities in-country. – Interest in fresh and frozen supply of fruit and vegetables. Agribusinesses are invited to submit an Expression of Interest to participate you can download the EOI form here. • Be able to host the buyers and accompanying delegates by presenting your business, facilities and providing sampling of produce. Expressions of interest are also being sought for agribusinesses that are willing to host and showcase their produce to the delegates in a luncheon or dinner setting. To register your interest in participating in the AMIB roadshow, please submit the attached EOI form by 5pm (AWST), Friday 15 February, 2019. 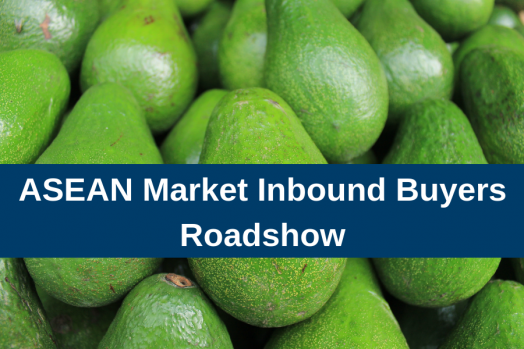 Please note: providing an EOI does not guarantee participation in the AMIB roadshow. DPIRD will organise the inbound market visit according to the needs and interests of the buyers and the export readiness and capability of the EOI applicants. If you require any further clarification on this initiative please email AsianMarketSuccess@agric.wa.gov.au. For more information on how the DPIRD can assist you to become export ready, please visit DPIRD’s Export Services webpage here.